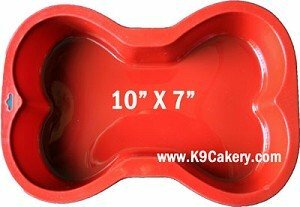 A dog bone cake pan is one of the most popular silicone cake pans that every dog bakery business should have on the shelf. At least one! We highly recommend the silicone pans due to their ease of use and great versatility. When choosing a cake pan, we encourage you to consider the material it is made of, the shape, and the size that is right for you. Dog bone cake pans, or any cake pans for that matter, are made from metal, foil, silicone, and even plastic. Each has its own purpose and thus, it's own pros and cons. Let's explore. Pros: are strong and sturdy. They distribute heat well, hold their shape, can be used over and over and last a long time. Cons: Metal pans can be expensive. They cannot be used in a microwave oven and are for use in the freezer. If not cared for properly, they can even rust (if metal) or pit (if aluminum). Using the wrong utensils will cause the metal to scratch off and leave imperfections in the cake. Silicone cake pans are some of the newest entries on the market. These are preferred by some for their versatility. Not only are they used for baking, but they can be placed in the freezer and create unique products like ice sculptures! Pros: Silicone can be used in the oven, the microwave and the freezer. It will never rust, will last a very long time and because of its flexibility, it is easy to remove its contents. Silicone cake pans are easy to use and versatile. Made from high grade, FDA approved silicone, they can be used in the freezer, microwave, regular oven and washed in the dishwasher. Cakes and dog biscuits will easily pop out without much effort to grease the pan. Depending on the mix, you may not even have to grease it. Cons: Silicone pans may cost a little more than their metal cousins. Due to their flexibility, they need to be placed on a sturdy base like a cookie sheet when in use. However, these are not necessarily cons when you consider how much effort they save! People with arthritis or joint pain will find it easier to make shapes - just press the dough into the molds. No rolling or cutting! Plastic cake pans are made with a special plastic that can withstand temperatures up to 375 degrees. Pros: Plastic pans are less expensive than metal or silicone, they don't bend like metal can but are almost as rigid as metal. They can be used in the oven or microwave. They are recyclable. Cons: Plastic pans can be used more times than foil but do not last as long as metal or silicone pans. They need to be placed on a sturdy surface when in use. This silicone baking pan comes in various sizes so you can adjust for the size of the dog. As you can see, with the myriad of options available, these silicone cake pans are a good standard in the industry. This silicone cake pan is 13" x 10". 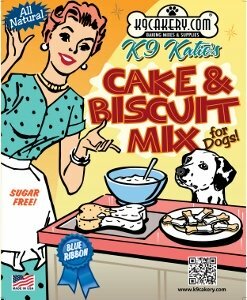 It makes a slightly larger dog cake than the standard size pan, but is recommended if you are hosting a large party with large dogs. It is also a great choice if you plan to celebrate an opening of a new pet business and want to serve a dog themed cake to your human guests. 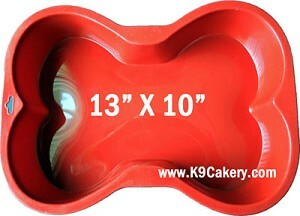 The silicone cake pan shown above is 10" x 7", which yields a standard size dog cake. 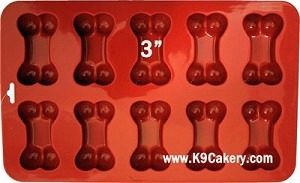 This popular silicone cake pan yields 18 small bone shaped dog treats. Why spend your time and effort rolling and cutting when you can easily load up the little wells and produce 18 dog biscuits at once. They will pop right out and the pan is easy to clean. It can be used as a candy mold as well. 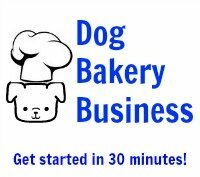 If you are opening a new business catering to dogs, place one or two homemade dog biscuits into a plastic bag, place your card inside, tie it up with dog-themed ribbon and you have a promotional piece. The image above shows the silicone pan that you can use to create 10 three-inch dog bone shapes at once. This pan is very useful when making dog treats that need to be a little larger than the mini size featured above. The larger size offers easier decoration versatility as well. The above dog biscuits were baked for 15-18 minutes in the oven and then allowed to harden for another hour. They popped right out. 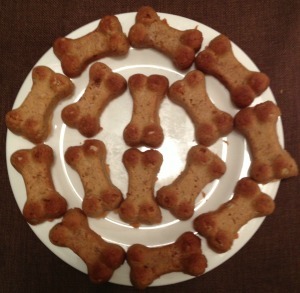 The photo below shows the larger bone shaped dog biscuits on top, and the mini bone shaped dog biscuits below. The middle row showcases mini paw print dog biscuits. 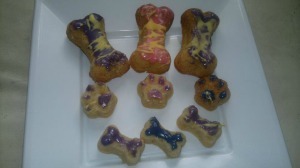 These dog treats were made by The 5 Dog Barkery. 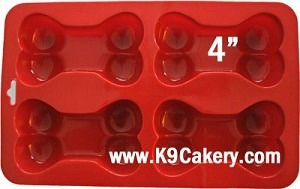 For even larger dog bone shaped treats, use this silicone cake pan that provides four wells that are 4 inches long. These larger dog bones make perfect large dog treats. Click this link: silicone cake pans to find silicone baking pans to create paw print cakes and dog treats.